A sector that should be ideally suited to the use of invoice finance to improve cash flow is the medical reports production associated with litigation cases. For example these could be medical reports in support of road traffic accident disputes, personal injury claims or medical negligence claims. Whilst few invoice finance companies will handle this sector, we can provide access to those that will. The reports are normally produced by an expert witness, or professional witness, often a medical practitioner, such as a doctor, who is qualified to give an opinion about a patient (claimant) or a particular aspect of a case to a court. However, the issue tends to be the highly extended payment terms that are common within the sector. In some cases it can take a year (or even more) to get paid. The normal modus operandi tends to be that the medical reports company has to pay the expert witness e.g. a doctor, that produces the written report early on in the case. The medical reports company do not get paid until the claim is settled, following a court case in some instances, which can lead to highly extended payment terms. The debtors tend to be a firm of solicitors, so it can be difficult to establish their good credit standing, due to their business structure, which can lead to problems setting credit limits for insurance purposes. There may also be agreed payment deadlines prior to the end of the case, but again these terms tend to be highly extended e.g. 1 to 2 years. This creates a funding gap between paying the expert, and getting paid, which whilst ideally suited to invoice finance, is not considered by most invoice financiers - due to the extended credit period taken. Most invoice financiers don't want to wait for a year to see if invoices that they have funded against are going to be paid. Typical recourse periods will be around 90 to 120 days. The good news is that not all invoice finance companies work in the same way, some will offer you an extended recourse period. We are able to put you in touch with financiers that can offer up to a 12 month recourse period (that's a one year recourse period), giving you a very extended period of credit between receiving funding against your invoices, and them having to be paid by your customers. The other facet of successfully dealing with long payment terms is ensuring that you have adequate credit control procedures in place. In some cases a full credit control service can be provided by the financier, as part of the packaged offering, or on a standalone basis. The prepayment levels are likely to be somewhat lower than normal. Perhaps 70%, rather than the typical 85% that the industry regularly offers. However, even that level of prepayment is likely to be sufficient to significantly improve the cash flow of your company, enabling you to settle the bills from doctors and medical experts early on in the payment cycle. 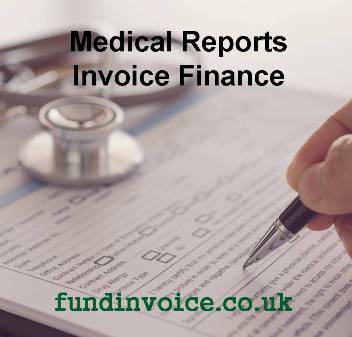 If you would like to know more about invoice finance against medical reports production, please get in contact or call us on: 03330 113622.